Join Charles Phoenix for a live comedy slideshow performance celebrating classic and kitschy American life and style! 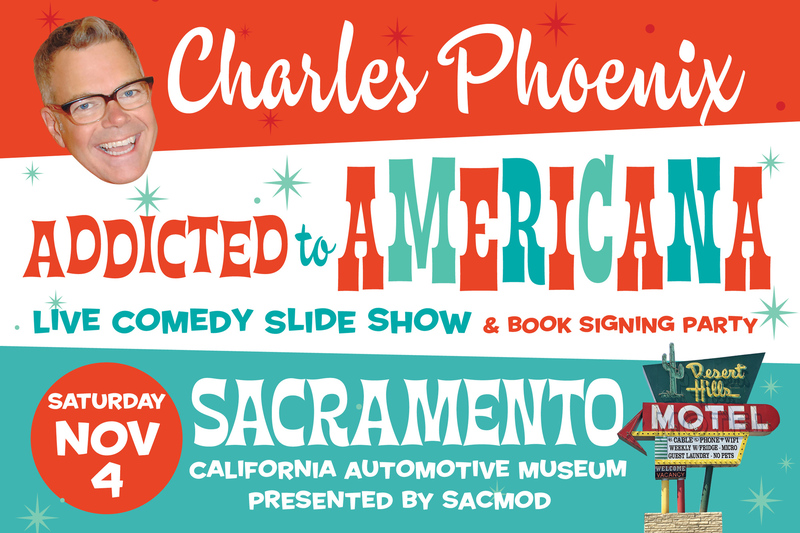 Hosted by the California Automobile Museum and presented by SacMod. Prepare to swell with patriotic pride when the Ambassador of Americana launches retro pop culture into the stratosphere! With unbridled enthusiasm and keen expertise, Charles unleashes his stories and glories of spectacular space-age style, amazing attractions, local landmarks, roadside wonders, fun foods, festive fashions, crazy car culture, futuristic transportation and more galore. Your imagination will be inspired and your American spirit will soar! Come for the show…stay for the Addicted to Americana book signing, classic cars and ice cream social! Festive dress is encouraged (but not expected). 7:30pm – Performance – Addicted to Americana. 9:00pm – Book Signing and Ice Cream Social – After the show Charles will sign copies of his new book, Addicted to Americana, while the Museum serves ice cream and root beer floats. A showman, tour guide, food crafter and author, Charles Phoenix is the Ambassador of Americana. He is known for his live retro slide show performances, fun filled trip tours, madcap test kitchen videos, and colorful coffee table books celebrating classic and kitschy American life and style. On TV, he has appeared with Jay Leno, Martha Stewart, Conan O’Brian, and as a judge on Cake Wars. Growing up in Southern California, Charles was educated at theme parks, thrift stores, and his dad’s used car lots. Fans enjoy his genuine reverence, keen eye and trust his guide to time-honored attractions from coast to coast. The New York Times says, “Call him the King of Retro”. His latest book is Addicted to Americana.